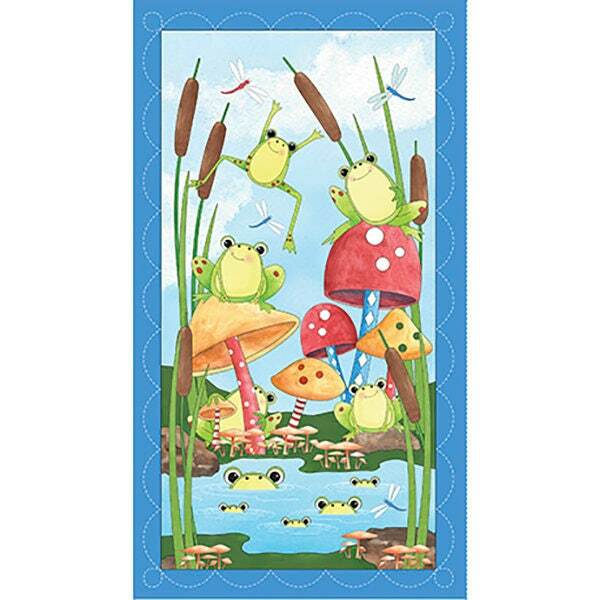 Bright colored silly frogs in beautiful shades of green sitting on lilly pads just having some fun. Beautiful dragon flies flutter by as the cat tails sway in the breeze. We can't forget about the colorful mushrooms in shades of gold, brown, red and white. Designed by Desiree's Designs for Quilting Treasures, this panel measures 44" x 23.5" and is perfect for quilting and home decor accents. Colors include black, brown, red, pink, blue, aqua, shades of green, orange, peach, yellow and white. All fabric from The Quilted Nursery Children's Fabric Store is cut directly from the bolt in continuous yardage unless otherwise specified. We now offer fractional yardage cuts for your shopping convenience. All shipping overages are refunded upon shipment of fabric. Same day shipping always except for holidays and Sundays!